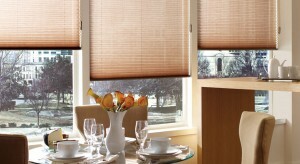 Pleated Shades offer the versatility of our honeycomb shades yet are a less expensive alternative. They are either manufactured in-house from quality components that will insure that they are durable over time, or provided to us by Hunter Douglas for which we are a priority dealer. With over 35 different fabrics, patterns, and colors to choose from in our collection they can match to any interior or style. We can also manufacture this product with angled cuts for custom jobs.